As the medical industry continues to demand smaller and more intricate components and devices, so the challenge for manufacturing them increases. The performance advantages of Fiber Lasers over conventional technologies in terms of beam quality, depth of focus and parametric dynamic performance have been well recognised. Coupled with the benefits in wall plug efficiency, process versatility, reliability and cost have led to an increasing level of deployment in medical device manufacturing in both fine cutting and micro welding applications. Figure 1. Welding examples demonstrating process control and hermetic weld quality. In welding applications, medium power Fiber Lasers in the range 50W to 400W offer new degrees of operational freedom and process control. The ability to operate with pulse lengths continuously tunable from a few microseconds to full CW operation and with pulse repetition rates up to tens of kilohertz offers the applications engineer the ability to optimise the process conditions over a wide range of applications. 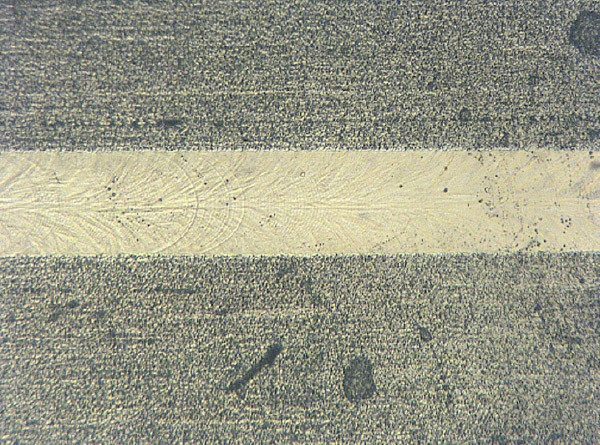 By appropriate choice of process conditions Fiber Lasers can weld across conduction, quasi keyhole and keyhole regimes. Due to their monolithic single mode fiber construction Fiber Lasers do not suffer from changes in focus position due to thermal lensing as the average power is changed, and don’t require periodic adjustment or tuning of the Laser cavity or component maintenance to ensure output stability. Process repeatability: Laser welding is a non-contact process which eliminates potential problems caused by wearing parts, contact deformation or contamination. Process control: The high beam quality and a resulting spot size control together with the continuously tunable average power of a Fiber Laser ensure that the weld energy is delivered only where it is needed and with exceptional control. This enables Laser welds to be placed very close to polymer seals, glass-to-metal seals, soldered components, and thermally sensitive electronic circuits. 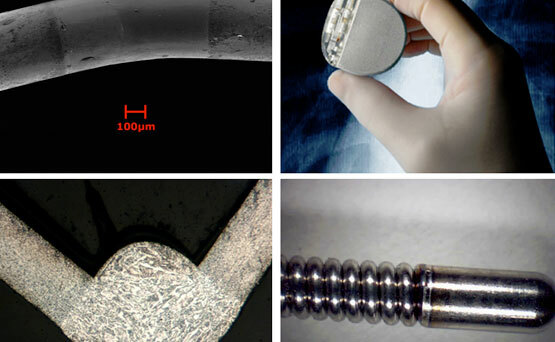 Hermeticity: Unlike soldering or brazing, Laser welding can provide high quality hermetic welds with high yield, both of which are fundamental requirements in the manufacturing of high value implantable medical devices. Surface finish: In addition to the aesthetic quality, the smooth and pore-free surface finish achievable enables reliable autoclave sterilisation. Our redPOWER range of Fiber Lasers have been designed to enable maximum process control and flexibility for precision micro welding applications using the following unique performance features. The Laser output power is continuously monitored and a feedback error signal generated to control the drive current of the pump Lasers in a closed loop control system. This technique uniquely enables the redPOWER QUBE products to provide exceptional output power stability, under CW or modulated operation. Output power stability of <1% and pulse energies with 3σ distribution <0.5% are achievable over time and the full operating temperature range of 10-40°C. For device manufacturing metrology, this capability also enables the process power output of the laser to be continuously recorded. There are certain welding applications where either the Gaussian mode profile of standard single mode Lasers is not ideal or a larger spot size than can easily be achieved using a single-mode laser is required. To address these requirements we have introduced a Low-Moded (LM) “M2~4” Laser which has a modified “flattened top” beam profile compared to the pure Gaussian mode of the single-mode laser. The redPOWER QUBE Laser offers the process engineer a unique combination of high power density in an optimised beam profile and large depth of field not previously available. This combination enables significant improvements in both modal stability and process tolerance (depth of field and working distance) in comparison with conventional highly multimoded beam sources. The standard operating range for redPOWER QUBE Lasers is from 10-100% of rated power. The Extended Performance Range (XPR) option on R4 HS Lasers enables the Laser to be switched to operate at very low average powers in the range 1-10% of rated power. This unique capability enables the user to access a wide range of process parameters. For example, using this feature the same Laser can be used from the very low powers required for fine wire bonding to the high peak power required for the hermetic seam welding of device enclosures. Under normal operation, when the Laser is pulsed following an idle period, a proportion of pump Laser power is absorbed in raising the Laser inversion to the threshold level for lasing action to begin. This results in an increased turn-on delay time for the first pulse and results in a loss of proportionality between the pump input power and the Laser power output. The Pulse Shape Equalization (PSE) function on redPOWER QUBE Lasers allows the user to set a level of pump bias which is sufficient to hold the Laser just below threshold. This ensures the first pulse turn-on delay is minimised and the energy in the first pulse is equalised with subsequent pulses in the train. In many micro welding applications, precise control over the temporal pulse shape is a critical requirement. In a Fiber Laser the optical output response is highly linear with the electrical drive signal. With an analog control bandwidth of 50kHz together with the PSE and XPR control features described above the redPOWER QUBE Laser had a unique capability for pulse shape optimisation. When considering a technology for medical device welding applications, our redPOWER QUBE Fiber Lasers offer compelling advantages over conventional alternatives. For many applications an SPI Fiber Laser is the ideal solution, bringing proven technology to enable reliability and high quality in high value manufacturing applications.